Most residents of downtown Manhattan and Brooklyn follow one unwritten commandment: Thou shalt not travel above 14th Street for food on weekends. And while we don’t always make the rules, it is our righteous duty to help you follow them. To spare you the pilgrimage uptown, we’ve rounded up the best spots for quality brunch, top-notch coffee, and unlimited booze from the East River to the Hudson. If you live uptown, we’ve got a guide for you, too, but your eggs might be fluffier at a lower altitude. 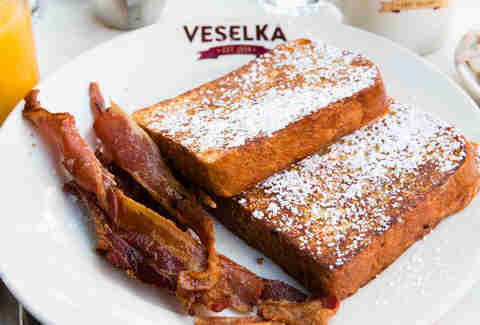 Veselka is downtown’s 4am post-bar Ukrainian comfort food destination, but it’s also perfect for the morning after. 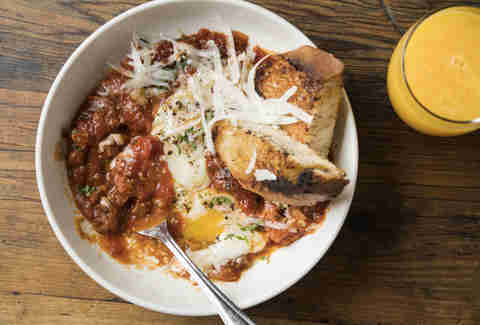 The popular Second Avenue spot serves a stealth solid brunch, replete with plates of carbs to resurrect you from your hangover. Get your strength back with heaps of French toast, fries, and mounds of potato pierogi in a traditional diner setting. They aren’t fancy here -- last night’s rumpled clothes will suit you fine. 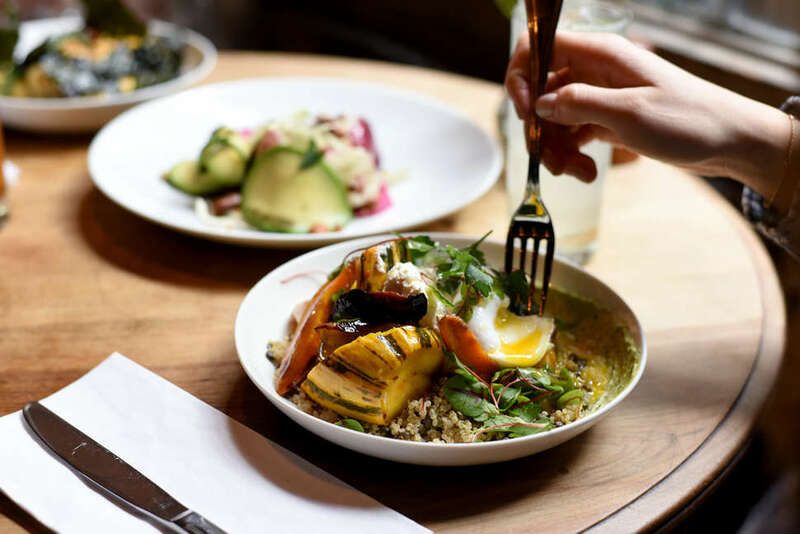 Everybody knows about Prune, that tiny East Side spot with the line that stretches down the street and around the corner. The one that has consistently drawn crowds for 18 years. The one where you can never get a table, so you’ve stopped trying. 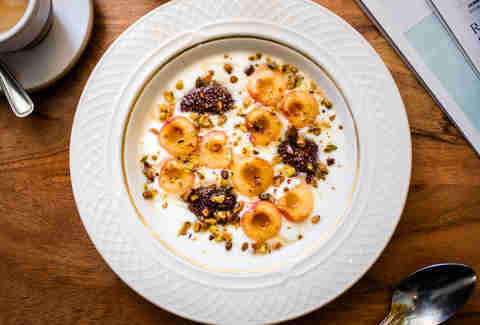 Helmed by Gabrielle Hamilton, the place serves simple staple dishes, each with a spectacular twist: cream of wheat is blended with buttermilk ice cream, omelettes plumped with fried oysters and remoulade, Dutch-style pancakes studded with oven-baked pears. The waitstaff gracefully moves at a breakneck pace to whittle down the line every weekend, but service never feels rushed. This Bleecker corner joint is a local favorite for after-work craft cocktails, but don’t sleep on the morning menu. S+P stocks an enormous DIY Bloody Mary station for weekend brunch, complete with more than 35 ingredients including pickle juice, olive brine, hot sauce, three types of peppercorns (because why stop at two? ), and horseradish. The pros are happy to help from behind the bar if you get drinker’s block. The Smile seems to draw one of the most attractive crowds in downtown Manhattan. It will make you wonder whether there is a secret society for beautiful people who brunch and if the staff has been lured from area trade shows. Equally photogenic menu items include a dainty English muffin egg sandwich perfectly proportioned with ham, caramelized onions, and Gruyere, baked eggs in a round ceramic dish bubbling with melted manchego and garnished with fresh avocado, and a perfectly symmetrical Belgian waffle with fig, cinnamon, and mascarpone. Everything is market-driven, fresh, and flawlessly plated. Eggs are great, but sometimes you’ve got to break out of your shell and try something new. 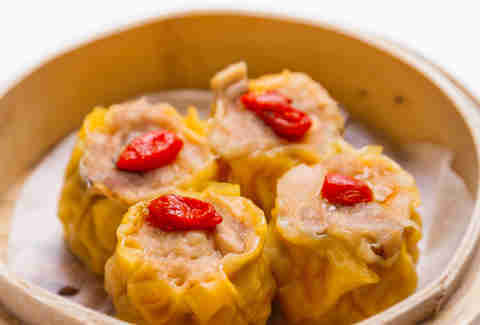 Tim Ho Wan, the buzzy East Village spot known for long waits and Michelin-approved cheap eats, deals in sweet BBQ pork buns, siu mai, pork-flecked turnip cakes, and sticky rice wrapped like a present in a lotus leaf, all for under $5 a pop. You’ll never just walk in on a weekend, so put your name down and take a stroll around the East Village to build up an appetite for your multi-course feast. It’s far more likely that you’ve found yourself jamming to reggae late into the night than brunching at this Jamaican restaurant/bar, but the daytime food scene is just as lively as the night crowd. Too many bottomless brunch destinations use free-flowing booze as a cover for mediocre food, but Miss Lily’s is a welcome exception. The food here is excellent even without inebriation. Opt for Jamaican rancheros with eggs over easy, piled on top of plantains, and drenched in a stewed pea sauce. Or grab a side of jerk pork sausage to complement your shaved coconut pancakes. Either way, your bottomless experience will not disappoint. 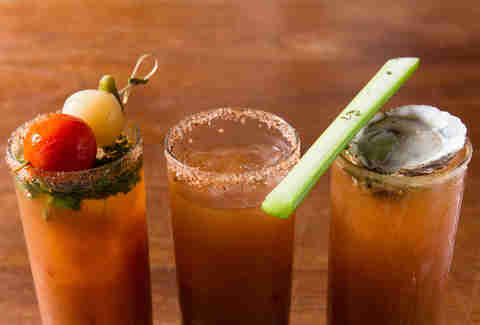 Brunch doesn’t always have to be a marathon of Bloody Marys and pancake-topped chicken & waffles. 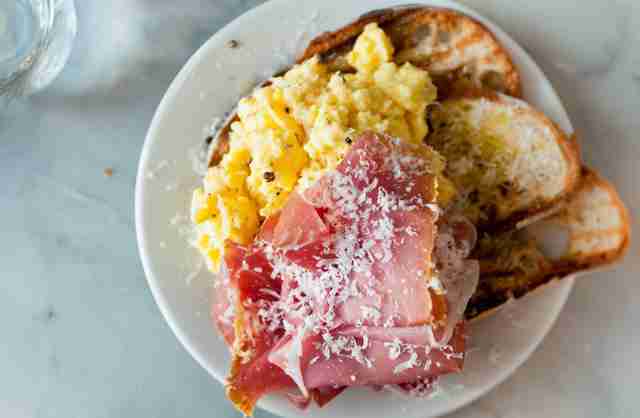 Bagels have been a go-to to-go NYC brunch favorite since time immemorial. The bagels here are boiled and baked on-site and are large enough to share. 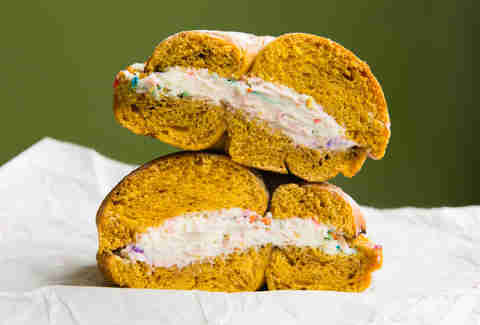 Stick to the classics like an everything bagel (untoasted, of course), with a schmear of cream cheese, or one of their myriad breakfast sandwiches. Named one of Thrillist’s best new restaurants of 2017, Atla is one of New York’s many all-day cafes. 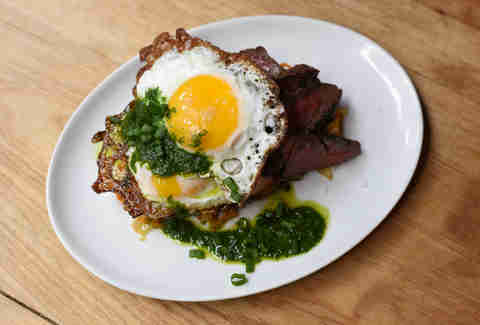 It’s helmed by the same team as Flatiron’s beloved Cosme, but with an effortlessly cool, casual (and affordable) edge. The small space is washed in sunlight through floor-to-ceiling windows every morning, making it an idyllic spot to start your day with a cafe con leche. 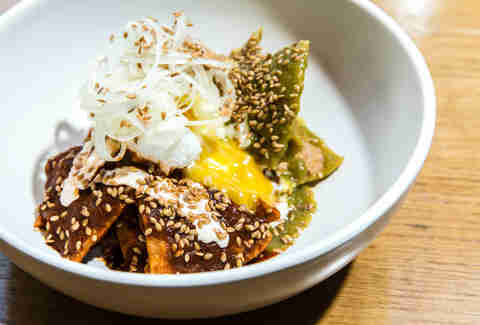 Sip that coffee with a bowl of spicy chilaquiles topped with a pillowy poached egg and a sprinkling of flax seeds and curls of cured onions, or crunch down on the arctic char and farmer’s cheese tostada: crisp blue chips piled with soft, sweet cheese, pink strands of arctic char, and a sprinkling of capers. It’s Atla’s little nod to bagels and lox. Some weekends call for brunch and some weekends call for tolerable bottomless coffee, stiff white toast, and no-fuss eggs: plain ol’ breakfast. 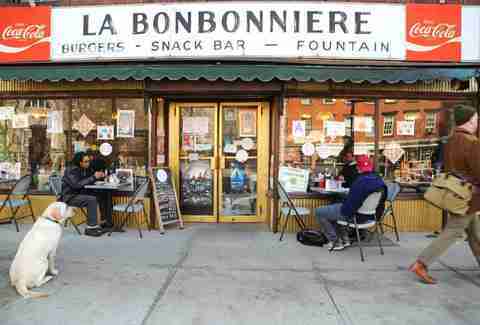 Escape from elaborate Benedicts and mimosas at La Bonbonniere, where you’ll sit in a cramped dining room featuring a wall-mounted payphone and lined with a mishmash of incongruous art (a signed portrait of Molly Shannon hangs beside a landscape of rural Peru). It’s the dive bar of diners -- and yet, the unapologetically basic breakfast menu of cheap omelets and pancakes is good enough to keep the dining room full on any given day. In a neighborhood teeming with aspirational cupcakes and unattainable real estate, this simple, elegant long-standing restaurant is unexpectedly accessible. The brunch -- like the space -- is refined, classic, and Italian: spicy baked eggs swim in tomato sauce dotted with pancetta and rosemary; the Dell’anima breakfast boasts sunny-side-up eggs, charred house-smoked bacon, hash browns, and a warm biscuit; and a breakfast carbonara swirls threads of tajarin with speck, egg, black pepper, and pecorino Romano. In warm months, sit outdoors on West Fourth Street, just far enough away from the bustle of Eighth Avenue. Fairfax is the antidote to NYC’s insidious “club brunch.” It’s where you go to unwind, to get away from your wheezing radiator and noisy pipes. It’s what you wish your IKEA-furnished living room could be: There are cozy couches, bookshelves overflowing with trinkets and coffee table books, lush plants, and beautiful West Village locals noshing on the Danish breakfast (rye toast, hunks of Cheddar, cucumbers, soft-boiled eggs) and nibbling smooth, sweet yogurt crowned with pomegranate, chia, pears, granola, and chestnut honey. When you’ve graduated from your wild, hair-of-the-dog hangouts, visit Fairfax for a taste of West Village elegance. The Loyal is not for the indecisive. The menu is long and varied, split into seven categories (griddle, eggs, toasts, raw bar, accessories, savories, and sweets), enticing enough to make you want to order something from each. 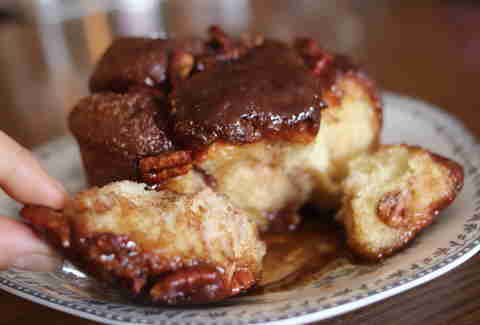 Olive oil skillet cake is topped with ricotta and jam, and sweet monkey bread is balanced with a coating of cream cheese frosting. On the savory side, a truffle heirloom polenta comes pooled with bacon, broccoli, and a poached egg, and the burger, towered with Comte and a plump tomato, is served with thick duck fat tots. Come with a group and strategize how to sample as much as possible. Perched on a picturesque West Village corner, there is nearly always a bit of a wait at Joseph Leonard. 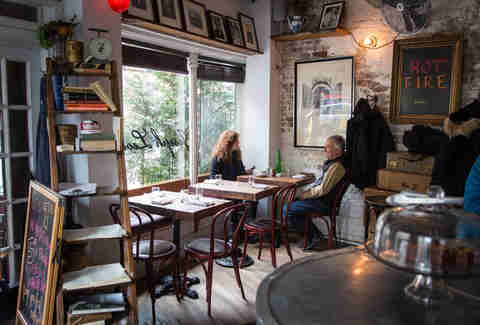 But the cozy, cramped quarters of this neighborhood bistro make it feel like the perfect romantic hideaway -- a respite from the chaos of Manhattan. Go for the chicken and waffles for two (paired with jalapeño-flecked cornbread, coleslaw, scrambled eggs, and fries), or share a couple of smaller dishes, like the perfect little egg sandwich (manchego, Brussels sprouts, and Sriracha on a croissant) and the French toast brimming with apple jam, monkey sauce, and whipped cream. Once the Eighth Street Bookshop, a Greenwich Village haunt of Jack Kerouac and Allen Ginsberg, this corner cafe is an architectural beauty. With a set of regal glass-paneled French doors, and rows of carved decorative columns framing enormous windows, this is the ideal spot to sit and channel your inner beat poet (or just read the paper). The coffee, shuttled straight from Stumptown’s New York roastery, is fresh, strong, and perfectly balanced, and the expert baristas masterfully produce complex latte art. Stave off that inevitable caffeine rush with a pastry or a sandwich, delivered daily from Roberta’s, Ovenly, and Doughnut Plant. Buvette affects the aesthetic of a Parisian cafe in the 13th Arrondissement. A bicycle with a wicker basket is parked outside, inside the space is littered with trinkets seemingly pocketed from European flea markets, and the menu is undeniably French. The eggs, delicate and airy, are steamed with an espresso machine wand, small baskets of fresh house-made baked goods abound, and the cocktail menu is lengthy and classic. Sip delicate dollhouse-sized espresso drinks with a perfectly melted croque monsieur topped with fresh ham and Gruyere, and plated with a delicate assortment of cornichons. A breakfast sandwich will cure whatever ails you, and Philadelphia import High Street on Hudson amps up the beloved NYC morning staple. The Bodega, an elevated spin on your neighborhood BEC, comes stacked with flattened and crisp breakfast sausage, a still-runny egg, and aged Cheddar on a flaky sage-black pepper biscuit. The Forager -- unlike anything you’ll see at any corner deli -- is overflowing with king oyster mushrooms, kale, egg, and Swiss cheese. Eliza Dumais and Amy Schulman have not been above 14th Street since their high school graduation. Follow ‘em at @elizadumais and @amyschulmaneats.